This is a concentration of the Ph.D. in Educational Leadership and Organizational Development program. Sport Management is a growing academic discipline, and our PhD is designed for those wishing to pursue a career as a college or university faculty member in Sport Management. The program has attracted students from around the world (United States, Canada, South Korea, Japan, Taiwan, Malaysia, Sweden, Germany) to study with the internationally recognized faculty. Our current faculty serve on multiple editorial boards, have authored or co-authored numerous sport management textbooks, and have a long history of engaging Ph.D. students in research. While there is no typical Ph.D. student, candidates with previous work experience in the sport industry as well as a clear research focus are preferred. Sport industry experience is extremely helpful for Sport Management faculty members since our discipline is very hands-on and the students we teach will be preparing for jobs where they will be teaching future sport industry professionals. We are proud to say that every student who graduated from our program is employed in a related academic or industry position. The job market is extremely competitive and students typically begin applying for jobs in the fall of their third year. Students who take advantage of the research, teaching, and service opportunities available to them while enrolled in the program have fared very well. A Ph.D. program is by nature a research-oriented degree where students are actively engaged in research teams with faculty members and other doctoral students. Students will also submit proposals for presentations at national and international conferences and write for publications. The Sport Administration (Ph.D.) program is accredited by the Commission on Sport Management Accreditation (COSMA). For more information about the 2017-2018 Student Learning Outcomes, click here. For more information on program accreditation, click here. The Doctor of Philosophy in Educational Administration/Educational Leadership and Organizational Development encompasses five specialties: P-12 Administration, Post-secondary Administration, Sport Administration, Human Resource Development, and Evaluation. It prepares graduates to understand and perform basic and applied research in their specialty area. The job market is extremely competitive and students typically begin applying for jobs in the fall of their third year. Students who take advantage of the research, teaching, and service opportunities available to them while enrolled in the program have fared very well in obtaining faculty and administrative positions. Currently, 100% of our graduates are employed in the field. Funding opportunities for the program are limited and highly competitive, no different than at any other institution. Funding opportunities may take the form of a GTA (Graduate Teaching Assistant) in the SPAD program, the Health and Sport Sciences Department, the College of Education and Human Development, or other academic or service units on campus. Students may also be eligible for selected University Fellowships. There may be opportunities for PhD students to be paid to teach courses in the program. Student interested in loans or other financial assistance should contact the Financial Aid office at 502-852-5511, or visit the UofL Financial Aid website. 1. Who is the contact for questions? 2. Do I need a master’s degree in sport administration to begin the Ph.D. program? Students come from a variety of educational backgrounds. To ensure students have sufficient mastery of the core content areas, students may be required to take graduate level courses in sport administration as part of their specialty component or elective component. 3. What is the timetable to complete a Ph.D.? Typically, it takes a full time student two (2) years to complete all of course-work in order to become eligible to take Comprehensive Exams. A dissertation typically requires 1-2 years of additional work. Students can finish the program in as little as three (3 years). 4. Are there opportunities for students to teach? Opportunities available to teach undergraduate and graduate SPAD classes. PhD students have taught undergraduate Principles of Sport Management, Sport Finance, Sport Marketing, Legal Aspects of Sport, and Sport Facility Management. On the Masters level, PhD students have taught Organizational Behavior and Research Methods courses. 5. The degree is actually a PhD in Educational Leadership and Organizational Development (ELOD). What does that mean? Many sport administration or sport management programs across the country are part of larger PhD programs. 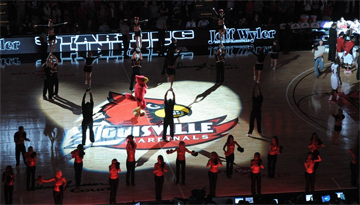 At the University of Louisville, ELOD is the umbrella degree for a variety of programs. This association allows us to utilizes the resources of the Educational Leadership program while still providing a comprehensive sport administration curriculum. 6. What are the admissions review dates? October 1 and February 1. All paperwork is due before these dates to be considered for admission. Send all materials to: University of Louisville, Office of Graduate Admissions, 105 Houchens, Louisville, KY 40292. 7. How are applicants evaluated? The following questions are a key part of the evaluation process: Is the applicant likely to succeed in doctoral study? Is there evidence the applicant possesses professional expertise and promise? Does this doctoral program (and chosen concentration) appear to be a viable match for the applicant's goals? 8. What are the required application materials? For a complete description of required materials, please visit the PhD in ELOD page. 9. What sources of funding are available? Funding opportunities are limited and highly competitive, no different than at any other institution. Funding opportunities may take the form of a GTA (Graduate Teaching Assistant) in the SPAD program, the Health and Sport Sciences Department, the College of Education and Human Development, or other academic or service units on campus. Students may also be eligible for selected University Fellowships. There may be opportunities for PhD students to be paid to teach courses in the program. Student interested in loans or other financial assistance should contact the Financial Aid office at 502-852-5511, or visit the UofL Financial Aid website.